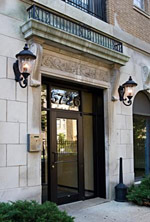 Located in the Historic Bryn Mawr district of the Edgewater neighborhood, 5726 N. Winthrop offers a wide selection of renovated apartments at affordable rents. The building is a short walk to the beach and the many cafes, shops, and restaurants of the restored historic district. Convenient transportation to downtown, Loyola and other universities makes this property an affordable alternative to Lincoln Park and Lakeview apartments.